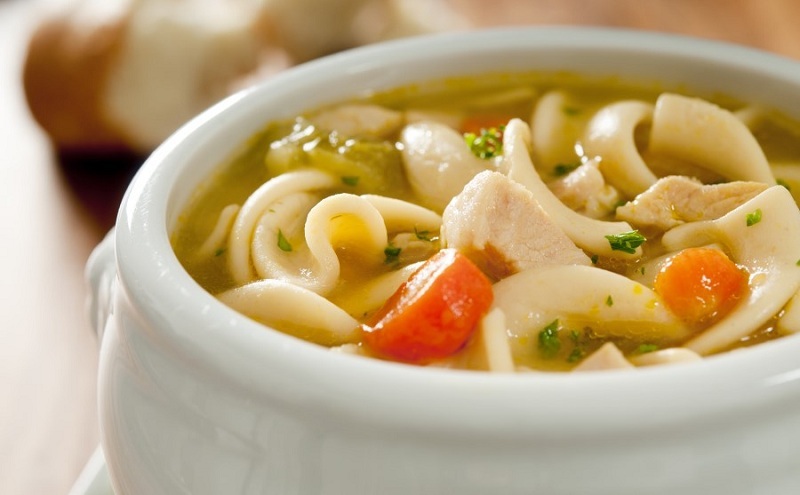 Home » Health » Does Chicken Soup Really Cure a Cold? “Feed a cold, starve a fever” is an old saying that dates back to the 1500s. Traditionally, chicken soup has been used as a cold cure. While none can deny that a nice cup of hot soup is comforting, and the steam can actually help open up a congested head and chest, there may actually be some scientific validity behind the cure. During the Middle Ages, it was thought that colds were caused by literally being cold. The solution? Hot food to bring the body temperature up. Soup was something even the poorest could afford to make, so that was the beginning of using it as a “cure.” However, scientists today have some facts that may back up the claim. One research study conducted at the University of Nebraska Medical Center in Omaha found that a substance in chicken soup slowed the growth and movement of neutrophils, which are a type of white blood cell that causes inflammation in the chest. Reducing and slowing these cells down helps relieve chest congestion and inflammation from coughing. Another study published by the Chest Journal, the official publication for the American College of Chest Physicians, found that certain spices and seasonings carried in steam from chickens soup eased sinus and chest congestion. The nasal mucous viscosity was increased by 6.9 – 9.2 mm per minute with each sip, compared to 6.2 – 8.4 mm per minute for plain hot water. However, it isn’t just stuffiness that’s relieved by mom’s chicken soup. One of the dangers of cold and flu is dehydration. Soup helps replace fluids and salt lost when you have a fever, and remaining hydrated helps thin the mucous membranes to carry the virus out of the body. Since chicken soup is relatively mild in flavour, it’s easier on the stomach. The ingredients in chicken soup also offer immune-boosting properties. Carrots contain vitamin A, and chicken stock itself is rich in zinc. There’s also the antibiotic properties of garlic, onions and parsley to consider. The truth is, none of these studies are conclusive. Some in the medical community attribute any improvement to the placebo effect. However, there’s no doubt that chicken soup is comforting, and getting proper nutrition and the right amount of fluids is essential for faster recovery. It’s also good for your well-being and health to feel cared for when you’re sick. Whether it’s science, sustenance or a little of both, the outcome is the important thing. If you need a little extra help to get you through cold and flu season, prepare for winter with Ease a Cold products.